Lauren wiped the tears from her cheek with the sleeve of her blouse. "Oh look at the crybaby," Rebecca shouted, bringing attention to her. "Look at her blouse. It’s practically rags. It matches her shoes though. Ha ha ha!" Lauren hung her head low and walked off the playground, heading back into the school. Every day it was the same thing. Rebecca embarrassed her in front of all her classmates. She either brought attention to her clothing, her hair or what she had brought for lunch. Rebecca didn’t lack for anything. She was the prettiest girl in the school class. She always wore nice clothes that looked brand new and matched perfectly. Her hair was always done nice with ribbons and clasps. She was the best in sports and all the other girls fought over who would be on Rebecca’s team. Lauren, on the other hand, wore the same clothes to school each day, she wasn’t good in sports and her hair was cut simple and straight. She didn’t live in a fancy house like Rebecca did. Her father didn’t drive an expensive car. In fact, their family didn’t even own a car. Lauren took the bus or walked everywhere. As she entered the school building, she noticed her teacher, Ms. Abernathy, hanging up a sign. Lauren walked over to it. It was announcing a contest for all the children in her class. Whoever wrote the best essay about a famous person in British history, would win a trip to London and attend a tea party with the Queen. Lauren was so excited. She would love to go to London and have tea with the Queen. As she stood reading it, Rebecca and her friends walked by, pushed Lauren out of the way and looked at the sign. She turned to her and said, "Surely you don’t think you would win, do you?" she scoffed. "They wouldn’t let somebody like you have tea with the Queen!" The other girls started laughing and Lauren ran up to the classroom. She was very angry with Rebecca and tired of being made fun of. She decided right then that no matter what Rebecca or her friends said, she was going to enter that contest and win the trip to London. The deadline was in two weeks. She’d have to work hard, study and not watch television. Which person should she pick? She thought about all the famous people she knew from her history books and then a thought came to her. Last week she’d gone with her mum to Edinburgh Castle. She’d really enjoyed going into St. Margaret’s chapel. "I’ll write about her," she smiled, happy with her choice. After school she went to the library. She checked out several books on Queen Margaret and began writing her paper. Each day, Rebecca teased her about the contest, but that made Lauren all the more determined to do her best and win. At last, the contest was over. Today Ms. Abernathy was going to announce the winner of the contest. "Boys and girls, I’ve read all of the entries. There were ten of them. Thanks to all who wrote an essay. I know it was a lot of work, but we can only have one winner. So, without further adieu, I will announce the winner. Lauren Brown, you are the winner. She wrote a fine essay on Queen Margaret of Scotland." Lauren jumped up and started to clap. She couldn’t believe it. She won first place! The class gave her a grand applause, all except for Rebecca, who had a scowl across her face. Lauren felt so proud and so happy. When school ended and Lauren was walking out of the building, heading for home, Rebecca ran up to her. "Lauren, what are you going to wear to visit the Queen? Perhaps some old rags and scuffed shoes? You shouldn’t have won. I should have. You don’t deserve to have tea with the Queen or even go to London." It just so happened that Ms. Abernathy was standing near the door and heard what Rebecca had said. "Rebecca! You stop that right now and come to my office immediately. Lauren, please sit on the chair outside the office door. I want to talk to you after I am finished with Rebecca." Rebecca was in Ms. Abernathy’s office for a long time. Ms. Abernathy opened the door and called Lauren in. "Go ahead, Rebecca," she said, scowling at the girl. I’m sorry for what I said, Lauren. I’m glad you won. You did the best essay. Ms. Abernathy let me read it. It was much better than mine," she apologized. "If you’d like, you can borrow some of my clothes to wear to London." Lauren was surprised. "Thank you, Rebecca. I accept your apology, but I have my outfit all picked out that I am going to wear. Thank you anyway." "Now, you two try to get along. You’re both good writers and you need to set a good example for the other children in the class," Ms. Abernathy lectured. "Yes, Ms. Abernathy," Lauren said. "Thank you, Ms. Abernathy," Rebecca added. Rebecca had promised to try to be nicer to Lauren and Ms. Abernathy was going to hold her to that. Lauren flew to London with her mum. What great fun she had having tea with the Queen at her palace. They had crumpets, tiny chocolate éclairs, petit fours, cream puffs and tea in beautiful china with tiny roses on it and silver spoons. Lauren had her photo taken sitting next to the Queen. She was holding her teacup. She took a copy of the photo to school when she got back and told the whole class about her trip. "Here, I brought this for you," Lauren said, handing a present to Rebecca. "Open it and see," Lauren smiled. Rebecca carefully took the beautiful wrapping and ribbons off the package. 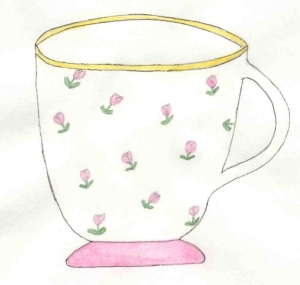 "Why, it’s a teacup, just like the one the Queen was holding," she laughed. "It is the cup she was holding. She gave it to me, after it was washed, of course. I knew you would like it, much more than me. I have my photo and lots of memories. I hope you like it," Lauren smiled. "I love it. Oh, thank you Lauren. That was so nice of you! I’m so sorry for being so mean to you. You looked lovely in your dress," Rebecca said. From that day on, Rebecca and Lauren were friends. Lauren’s essay was published in the local newspaper and they did an article on her, including the photo of her having tea with the Queen. Lauren was happy and continued to do the best she could at everything she did.